As the Alumni Relations Coordinator at CEA, Shayla Auer continues to build a strong Alumni Ambassador team that promotes study abroad on U.S. college campuses. Shayla enjoys helping CEA alumni translate their study abroad experiences into life and career skills and further share their international experiences on their home campuses. 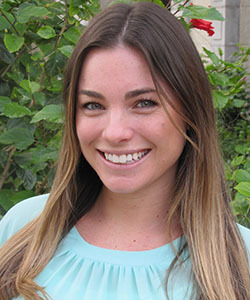 Originally from Arizona, Shayla attended University of Colorado in Boulder. While earning a Bachelor of Science in Business Administration, she completed a study abroad program in Seville, Spain. After graduation, Shayla moved back to southern Spain to teach and work in the field of study abroad. Since 2012, Shayla has worked within various departments at the CEA Headquarters in Phoenix and on-site at the CEA Seville Center. Living in Spain for five years, Shayla learned to speak Spanish and continued her world travels. A few of her favorite locations are Portugal, Costa Rica, and Australia! Working and studying abroad has had a powerful impact on her life and career path. Her international experiences inspired her to pursue a career in international education and to share her experiences with others considering a study abroad experience. Next on her travel list – Buenos Aires, Argentina!